The load chart provides a central overview of the allocation of all relevant resources that is always up-to-date. Click the InLoox PM tab, then click in the InLoox PM Ribbon, in the Views group, Resources. Click Projects at the bottom of the screen and then click Resources in the tree structure on the left. In this case, the Resource Overview loads resources system-wide. In Outlook 2007, click Extras in the InLoox PM Toolbar and choose Resource Overview from the list. You can also load the resource overview for a specific project. For more information, please see Call up and manage resources. You can adjust the utilization view and add any resources from the Divisions and Teams side panel. In the View group, click Divisions and Teams to invokes this side panel. Select a division or a team and drag it into the utilization view. In the view the group utilization is now displayed. Via Drag& Drop you can also remove the selected division or team back to the side panel. 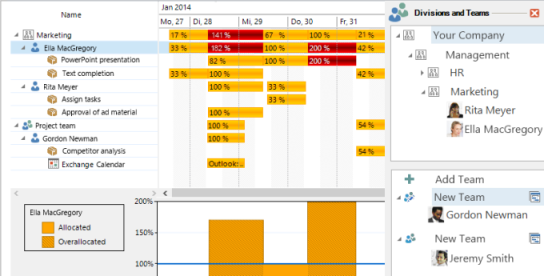 Show and hide resources in the utilization overview by clicking Planning symbol . To learn how to add the resources to the departments or teams, see Adjust the division structure and Add resources. The view always filters the resources and workloads by the time period specified by Select time period. The example shows the overloading of the resource "Ella Macgregory", which results from the occupation in two activities. If appointments are on record in the Outlook calendar of an Exchange resource, the resource counts as fully loaded (100%) in the given time period. To hide the calendar deactivate the option Display Exchange calendar. Today's date is shown by a vertical yellow day line. A click on the arrow left from the element displays the workload details. These include the work packages and activities to which the resource is assigned and. A double-click on an element opens a Details dialog box. A click on an element displays a graphical overview of the workload data within the defined period. The percentage indicates the workload of the resource. The time period and duration display the length of the workload. A yellow field indicates that a resource is occupied, but not over allocated in the specified time period. A shaded yellow field indicates that a resource is over allocated in the specified time period. You can edit several entries in the load chart at the same time by clicking the respective entries while holding down the CTRL key. Then right-click to open the context menu and perform the required action. How to use the workload diagram | InLoox PM 8 • Copyright 1999-2019 © InLoox, Inc. All rights reserved.